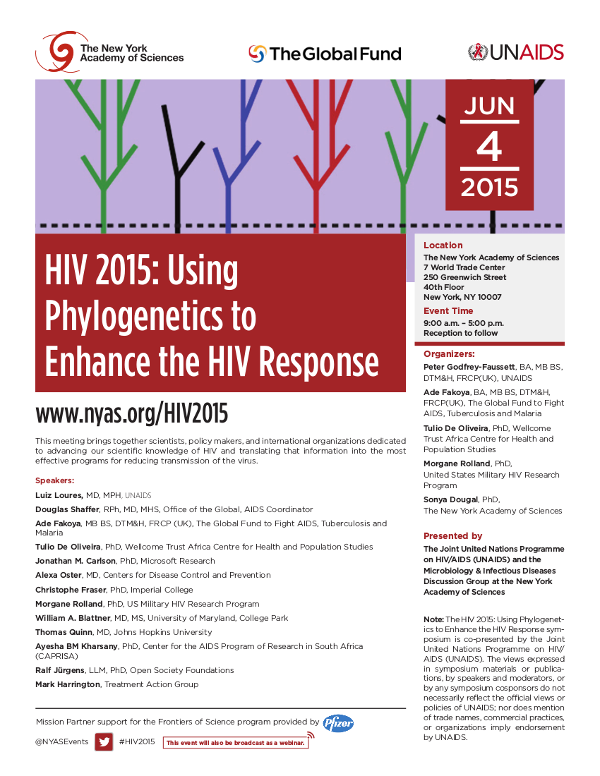 A discussion meeting presented by the Joint United Nations Programme on HIV/AIDS (UNAIDS) and the Microbiology & Infectious Diseases Discussion Group at the New York Academy of Sciences on the use of phylogenetics to enhance HIV response. Rapid advances in molecular genetics and bio-informatics allow more and better data on the phylogeny of HIV to be collected. The genetic diversity among HIV strains within individual patients, communities and globally allows the dynamics of transmission and evolution of the virus to be studied in ever greater detail. The implications for drug resistance, vaccine development, transmission networks and evaluation of prevention interventions are beginning to be understood. The challenge is to translate the new science into more effective ways to prioritize the HIV response and to monitor the impact of different intervention approaches. This meeting brings together scientists, policy makers, and international organizations dedicated to advancing our scientific knowledge of HIV and translating that information into the most effective programs for reducing transmission of the virus. - Science, 12 June 2015, by John Cohen - Molecular Epidemiology: HIV family trees reveal viral spread.